I leaped off the smooth, onyx rock where I had been resting. I would never want to be late to such an important occasion. I am so happy for Mariana and excited for her new life with her father and adorable little FinFriend, Rico. I swam as fast as I could to our changing area where I could quickly fix my hair and get ready for the big night ahead. As I swam through the pearly ornate doors of the room, I wasn’t prepared for the sight of my princess sisters in full glamour mode! Jia had beautiful lavender sparkles along her thick, black lashes. Waverlee’s blonde tendrils were perfectly curled and held by a gorgeous pink floral crown. I spotted a braid of fiery red hair with silky weaves of malachite and jade belonging to Brynn. Serena had filled in her pillowy lips with a magenta coral stain. Zoey’s shimmering green eyes had been lined with stunning cobalt. Destiny hummed as she carefully clasped three tangerine agate bracelets onto her left wrist. At that moment, the other Mermaidens realized my presence. “How’d you manage to slip in ‘ere bonny?” questioned Brynn. All my other sisters smiled. “Crys, you’re here, finally! Are you ready for tonight?” asked an excited Waverlee. I ignored their questions and immediately swam to Mariana. “What do I think? I think that you look like a gorgeous mermaid princess ready to conquer the world,” I said. All eyes were on Mariana. I could feel the warmth and love radiating from every tail in the room. Our lives never felt incomplete without Mariana, but with her, she inspired each of us to never stop fighting for our dreams. Mariana’s face turned bright shades of crimson red as her lips curled into a smile. “Perhaps you silly girls were right. Amani was looking for me to ask if I’d reserve a special dance for him tonight.” She gave a quick, tight giggle. “There we have it, lasses! Our girl’s got a glad eye,” shouted Brynn. As the other princesses surrounded Mariana to pepper her with questions, I brushed my hair and straightened my top. Although I hadn’t tried on my tail skin for the post-ceremony celebration, I trusted the MerCouncil’s helpers to pick out something that fit my personality and decided to keep my accessories simple. From a large clamshell sitting next to our vanity mirrors, I found a sparkling diamond armband with a matching ring. These diamonds were not only crystal clear, but were so pure they were almost blue. As I put these beautiful accessories on, I couldn’t help but get excited for the evening ahead. “It’s time to go. Your parents are waiting for you.” Appearing quickly and quietly, my mother was in the room to gather us for Mariana’s coronation. Together, we left the room feeling confident and ready for whatever the night would bring. We followed my mermom, Queen Caryn, into the MerCouncil’s chambers. The council area was surrounded by rings of rooms sectioned off with diamond barriers and filled with mermaids who had made the trip to support Mariana. My eyes immediately found my brother Sid. He was floating with a few other mermen when I caught his attention with a small wave. He gave me a quick smirk as I gracefully swam by. Darek, Chancellor of the MerCouncil, was waiting at the giant stone table that served as the central meeting point for the councilors. His gray, flowing hair was dancing below his shoulders while his thin, weathered face wore a bright smile. Perched in their clamshell cushions, the rest of the council members beamed as Mariana separated from the pod and approached our wise leaders. The crowd went silent. “Mermen and Merwomen of the world’s finest oceans and seas, I am here before you to present Mariana, the lost Mermaiden of the Mariana Kingdom. 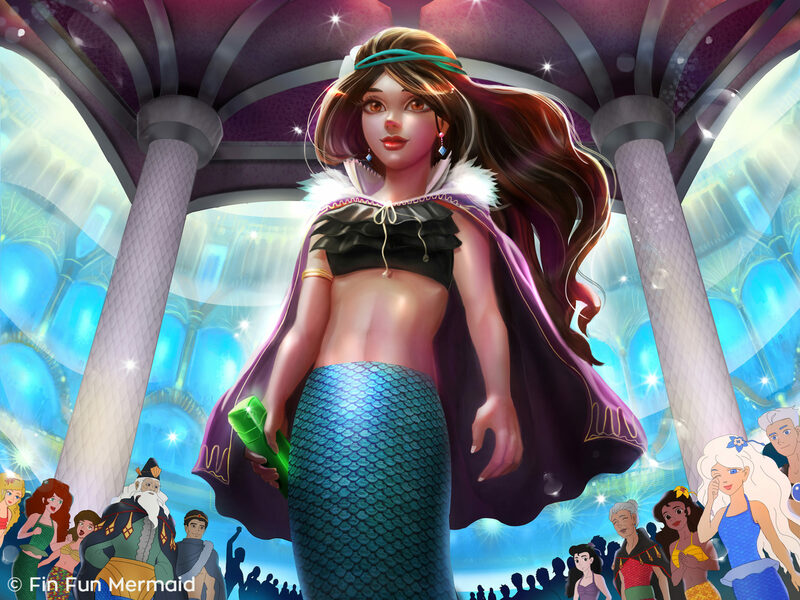 This lovely young merwoman has faced tremendous adversity in her life. As an infant, she was left parentless and forced to raise herself, with no knowledge of her birthright. We are so fortunate that the wild waters of life returned Mariana to her merfamily and she is here with us today. 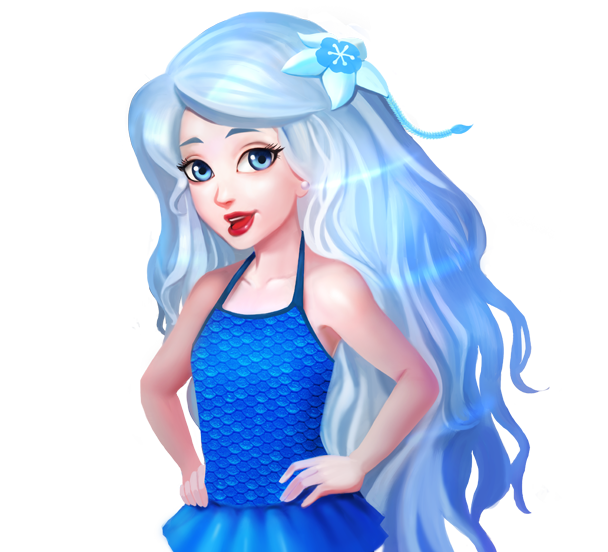 Mariana is a brave mermaid who rescued her father, King Caspian, after many years of captivity and helped protect us all when certain individuals chose an evil path.” At that moment, King Caspian left his clamshell and swam to his daughter’s side. Looking into Mariana’s eyes, King Caspian spoke. “My daughter, you are a treasure worth more than a thousand pieces of gold. I owe my life to you. Mariana of the Mariana Kingdom, it is now my privilege to crown you the eighth Royal Mermaiden Princess and bestow upon you a magical set of pearls that will help you in troubled times.” Darek opened an ornate turquoise and pearl box, removed a sparkling crown, and handed it to King Caspian. The breathtaking shimmer of the crown’s blue topaz and opal jewels drew an audible gasp from the crowd. As if she had been waiting a lifetime for the moment, Mariana let out a deep breath and bowed gently for her father to place the crown on her head. The tiara fit perfectly atop her chestnut locks. Carefully, King Caspian removed a beautiful set of pearls from an accompanying box and gently tied them around her neck. The audience broke into roaring applause. 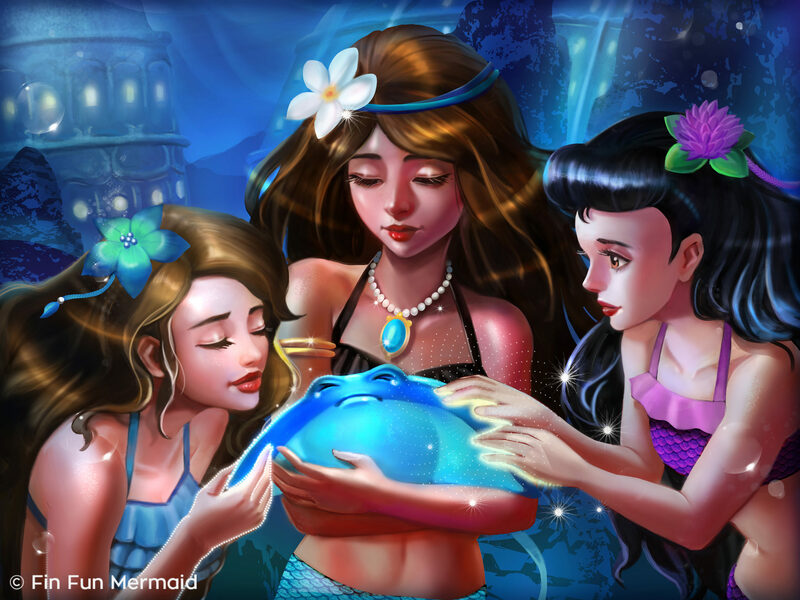 We Mermaidens couldn’t help ourselves – almost in synchronization, we swam to Mariana and embraced our new sister. “Mariana, I know we’re still getting to know each other, but I want you to know that you can always count on me,” I said with tears in my eyes. “Thank you, Crystal. 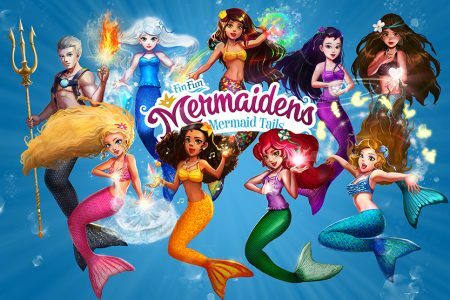 There’s still a lot of work to be done to restore my kingdom, but I know that I have the best mermaids in the world by my side.” We looked at each other – eight young merwomen with bright futures ahead. “You know, I’m still getting used to this hugging stuff,” Mariana said timidly. We all laughed deeply, our fins tickling. hi, whoever reads this has to know, I am a real life mermaid! me and crystal have the same name, personality, and that’s about it. oh, and I also have Fergus the seal! Hi I really want a tail and I really want your tail Mariana. I love fin fun! I’ve always wanted a tail but never had enough money! My favorite tails is Mariana’s! Fin fun is awesome! 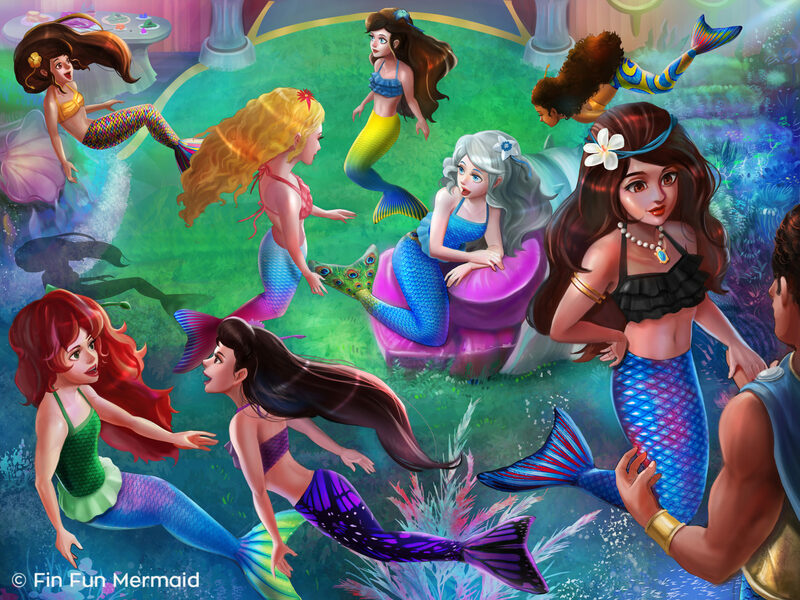 I wish I was a mermaid! can one of you tell Finfun to do audio books pleazzzzzzzzzzzzzzzzzz!!!!!!!!!!!!! I love this story and this series can’t wait till’ the next one! Love the story can’t wait until the one! I love the art for this chapter! Mariana is beautiful!